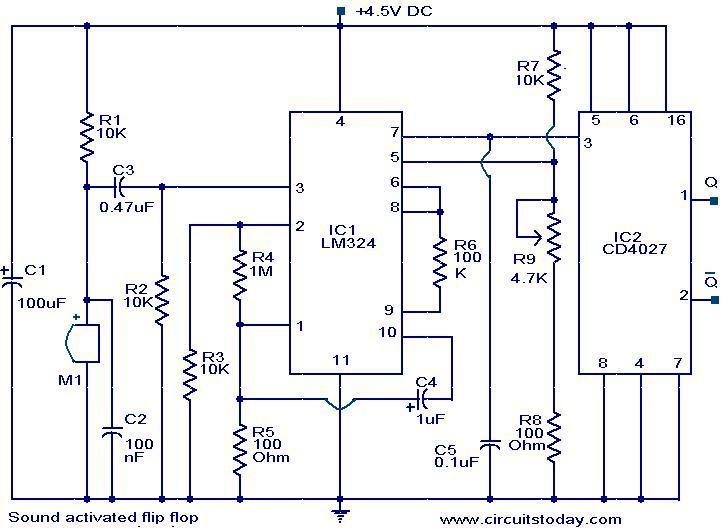 Here given is a circuit in which the status of the output pins of a Flip Flop IC can be toggled by using sound. A condenser microphone is used for picking up the sound. The first two op-amps in the IC1 LM 324 is used to amplify the sound picked by the condenser microphone. The third op-amp inside LM 324 is wired as a level detector. When ever the voltage produced due to sound have a level more than that of the reference voltage at pin 5 of the third op-amp, its output (pin 7) goes high, triggering the flip flop IC1 CD 4027.As a result the state of the output pins of CD 4027 ( pin 1 & pin 2) toggles for each burst of sound. The circuit can be powered from three 1.5 V cells in series. The mic M1 is a condenser mic. The sensitivity of the circuit can be adjusted by varying the preset R9. how do i make the connections for Q and Q(bar)? this will hold output the value for next sound …. ?